True conservatives are realists. We are guided by an ideology of limited government, fiscal responsibility, and dignity of life. When everything works correctly our conservative ideals provide a framework for understanding truth and using it to make the world a safer and better place. But ideology doesn’t always work that way. When it goes awry, instead of being a lens through which we see truth it can become a screen that keeps truth from filtering through. Conservatives should never fear the truth or distort it to make a point. Under the guise of conservatism some are misrepresenting the truth about immigration reform, particularly when it comes to trumped up or misinformed concerns about amnesty. In 1977 Jimmy Carter granted unconditional amnesty to over 100,000 American draft dodgers. Gerald Ford had suggested a conditional pardon for draft dodgers, but Carter removed all penalties and welcomed draft dodgers back to the United States with no measures of accountability for their actions. That’s amnesty. No one that I know of is promoting this kind of unconditional pardon for those who have overstayed their visas or entered the country illegally. Those who are loudly protesting against amnesty for immigrants are either misinformed or trying to distract and mislead us. I fear it is usually the latter. Last month I had a chance to speak with a congressman here in Ohio about this issue. He stated very clearly that he was against amnesty. As the discussion evolved, however, he acknowledged the need for a compassionate solution to the challenge of the nation’s 12 million undocumented workers. He also conceded that he wasn’t against eventual earned citizenship for undocumented people. For the sake of clarity, allow me to describe the pathway to earned citizenship that is in last June’s Senate bill. Senate Bill 744 would immediately allow the vast majority of undocumented workers and their families to come out of the shadows and begin a long, difficult, and expensive trek toward earned citizenship, one that will cost them thousands of dollars and take nearly 15 years to complete. Senate Bill 744 would create a new category called “Registered Provisional Immigrant” status, which would allow undocumented individuals to step forward, admit that they are here illegally, volunteer for criminal background checks, and pay fines. After fines are paid and background checks are passed, their RPI status would allow them to have lawful employment and to travel back and forth across the border legally for six years. At the end of the first six years, they would be allowed to apply for a second six-year RPI status. This would require another round of criminal background checks and fines. There are also very strong provisions to make sure that immigrants are self-sufficient while on RPI status. Their RPI status would be revoked if they fall below the poverty line or are unemployed for two consecutive months. At the end of 12 years (after two criminal background checks and about $3,000 in fines) they can submit to one more background check and apply for a Green Card. 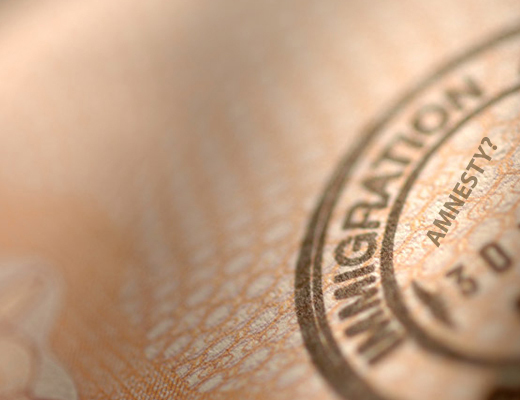 After obtaining a Green Card they can begin the process of applying for citizenship. To obtain citizenship they would need to learn English and pass a US History and Civics test that would stump many native-born adults. The Senate bill includes two other important provisions. First, measurable border security objectives would have to be met before the naturalization process could begin. And second, all people who were already in line for naturalization legally would have to be processed before naturalization could even begin for people who are currently undocumented. The earliest that this could possibly happen would be around 2029. This fall all eyes will be on the House as we wait to see how they respond to the challenge before them. The Senate bill isn’t perfect, and there are opportunities for House leaders to improve upon it by eliminating red tape, modernizing the process of coming legally, and raising the number of visas for both high-skilled workers and those who work in lower-skilled positions. Those who are opposed to it should speak honestly about their concerns, not hide behind false cries of amnesty. Carl Ruby is a consultant for the National Immigration Forum. Visit carlruby.com to see how he is networking among evangelical leaders and members of Congress to reform immigration.